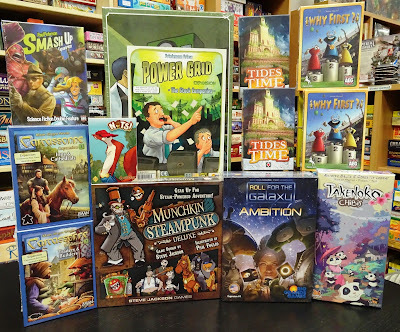 More new games and game expansions arrived this week. 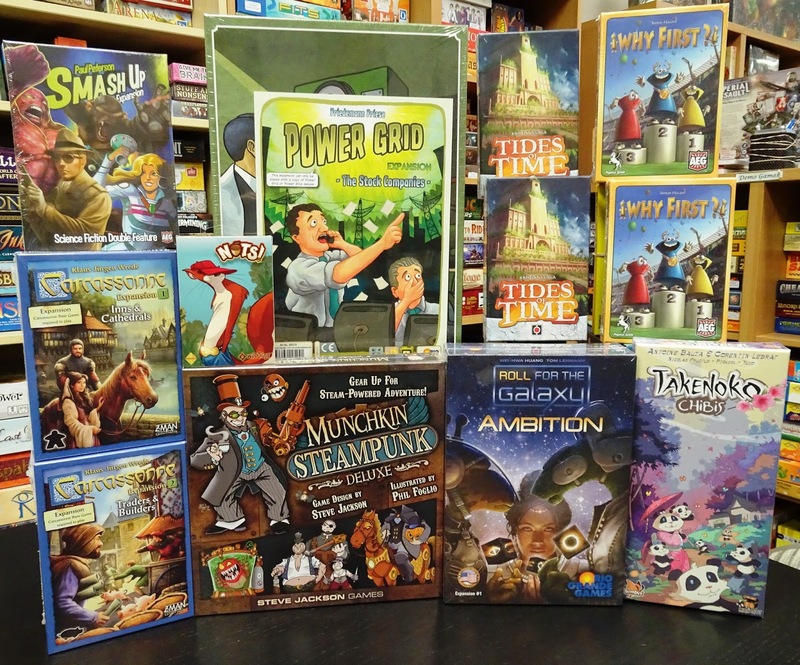 Come in and check out what's hitting the shelves. Gear up for steam-powered adventure in the latest Munchkin game from Steve Jackson Games. 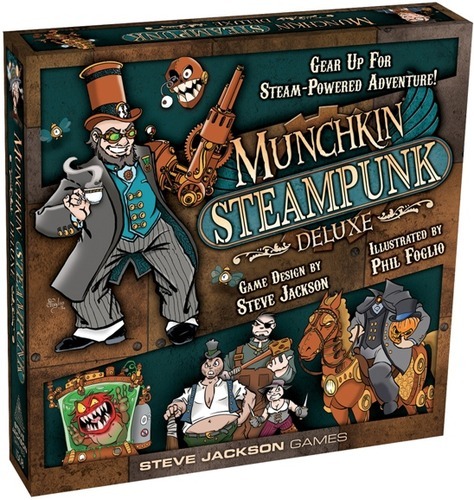 Munchkin Steampunk is a deluxe version that comes with a gameboard, pawns with plastic stands, 168 cards, and a die. So grab your gear, put on your top hat, chack the monsters, and grab the treasure... with the power of science. 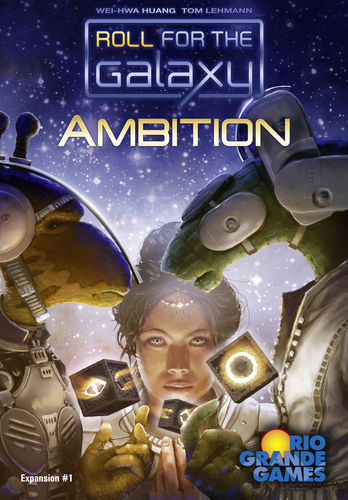 Roll For The Galaxy: Ambition is the first expansion to the base game Roll For The Galaxy, a dice game of building space empires. Ambition not only provides new factions, home worlds, and game tiles, but also adds two new dice types and optional objectives. Each player will have one and only one new black leader die that will replace one white home die in their starting cup. The second new dice type is the Entrepreneur orange die. 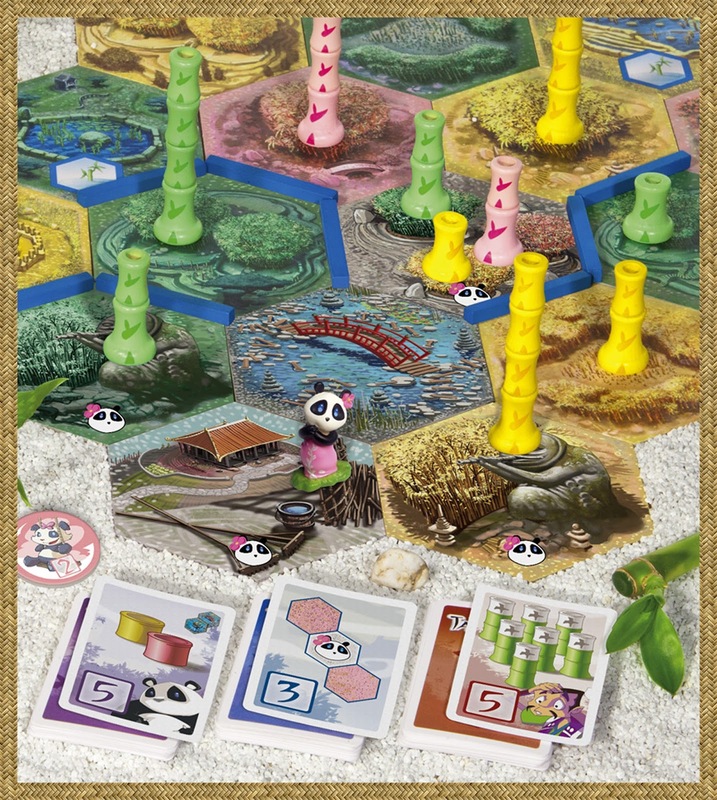 Takenoko: Chibis is an expansion that adds more fun to the tile-laying base game Takenoko, where a gardener moves around various garden plots making bamboo sprout and grow while a panda goes among the tiles eating said bamboo. 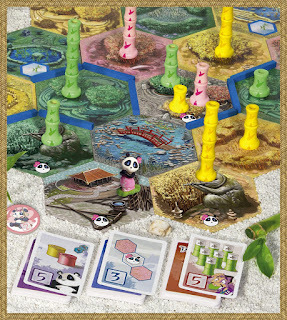 The Takenoko: Chibis expansion adds a mama panda and some baby pandas in addition to new objective cards. Now the gardener has to work extra hard to provide enough bamboo for all. Mama panda is a cute figurine outfitted in pink and brings with her baby pandas represented by tile icons and tokens. Her role is to get the baby pandas placed throughout the gardens. Baby panda tokens bring one of three bonuses when placed or victory points if in a player's reserve at game end. All of the new plot tiles have the baby panda icon on them. These new baby panda plot tiles include the Kamis Garden, Sacred Hills, Celestial Pond, and Gardener's Cabin with each type providing a new effect. 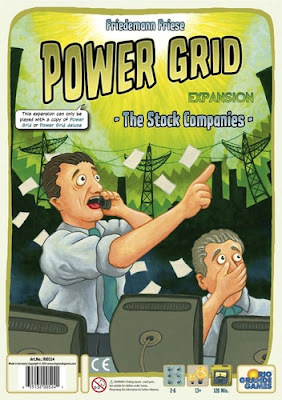 Power Grid: The Stock Companies is an expansion to the base game Power Grid a strategy game of planning with surges of energy. As shareholders, you want to get control over different stock companies so you can acquire the greatest wealth. 1) Players are trying to get shares of the most successful companies: the ones that supply electricity to the most cities. 2) Players control their private stock companies and try to establish them successfully on the electricity market. They sell shares of their own companies to generate more cash and then are able to buy shares of other players' companies. Thus, they can also earn a portion of the other players' successes. 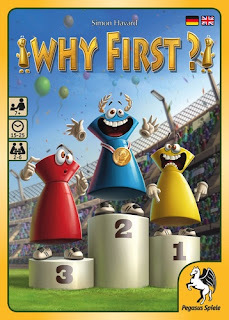 Why First?, a quick and crazy card racing game where need place second to win. After five rounds the winner will be the one who has scored the second-most points. Players begin each round with a hand of five cards that can range in point value of -4 to +5. The hands of cards are played one card at a time. Players will simultaneously choose one card from their hand and place it face down in front of them. Ready, set, go! players will then simultaneously take and place their face down card in front of any player they choose or keep the card. Players then tally up the value on any and all cards that ended up in front of them and move that many spaces (forward or backward) on the game board. Play continues in this manner for the first 4 cards in players hand. The last card and fifth card can only be played on themselves. Move as before. The player that ends up in 2nd place on the game board wins that round and is the only player that gets their score recorded. 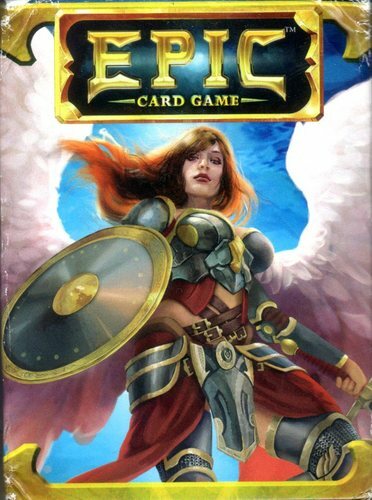 Epic is a fast-paced card game of fantasy combat for 2 to 4 players. It is designed to start quickly but also to reward deep, strategic plays. Players can play sealed, draft or constructed. In Epic, you take on the role of an elder god, in conflict with other elder gods. The cards in your deck are your champions, who fight for you, and events, which represent your will imposed on the mortal realm. A second deck can be added to play up to 8 players.